Last post I mentioned I started a bag which I’d gone right off as the variegated cotton worked up. I was so undecided about whether or not to stick with it but in the event, I did. Perhaps partly because I’ve not had a lot of crochet time during the day recently and the bag, worked in a simple single crochet (US) spiral was the easiest thing to pick up of a sleepy evening to get my fix! 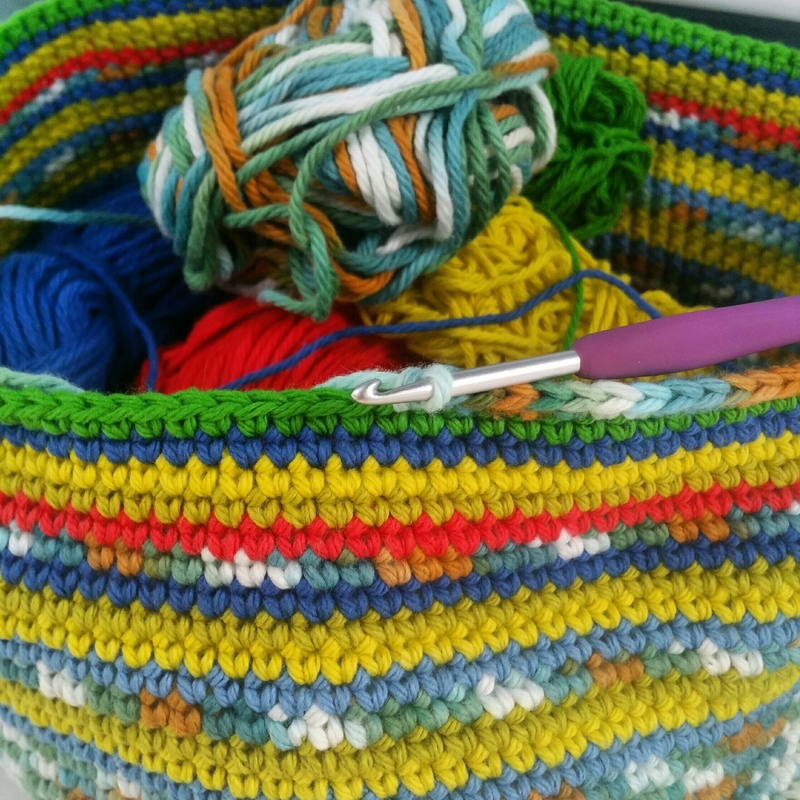 I don’t have a more recent pic, but I’ve added a lot more rounds of solids, and I’m up to the handles now – and still a bit hopeful it’ll turn out reasonably well. We shall see! Right now, I’m going to reply to your lovely comments of the past week, and then join a few more squares. Here’s to getting stuck into the border tomorrow – love that bit! I like the colours in your bag… They’re very funky. Hope you are pleased with it when it’s finished. Nice job on progressing with current wips. 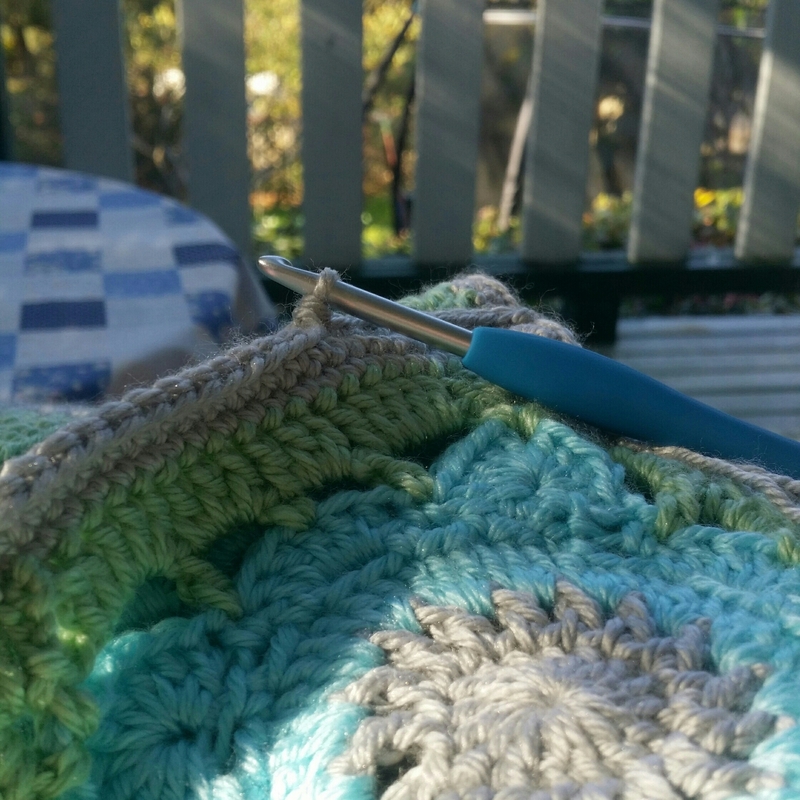 I have a feeling I may be frogging mine and starting again with a bigger hook, but i shall post about that sometime soon! Thanks Julia 🙂 What are you thinking about frogging? I just had a look but I don’t think you’ve posted about your current wip yet – unless you’re frogging that shawl, surely not?! Gosh no… Not the shawl! I started a corner to corner blanket that I haven’t blogged about yet. It feels a bit tight and rough so I’m wondering about trying with a bigger hook. I’ll try from a different ball of the same wool and then continue with the one that works best and frog the other. I love the colorful bag!! So bright and cheery! !